American classic that emerged in 1939 under Columbia Records actual title is "The Teapot Song." Clarence Kelley and George Harry Sanders authored the lyrics and music to an American score that would be sung in every household across the globe as a nursery rhyme to children. The song was picked up by the Lipton tea company as a theme song on their radio broadcast. Clarence Kelley and his wife choreographed an accompanying dance called the "Teapot Tip" for their dance school students who could easily learn the dance. This piece of was releases in 1939 under Columbia Records label. The song is played on a gramaphone and performed by Horace Heidt and His Musical Knights with Ronnie Kemper. This rendition was recorded in the musical genre of its day, Big Band style. The song sold over a million copies! Peter Pan Records released a version sung by Betty Harris in 1978. This is a more indepth article about the "The Teapot Song." I'm a Little Teapot. (2017). In: Wikipedia. Wikipedia. Kelley, C. and Sanders, G. (1941). "I'm A Little Tea Pot"-HORACE HEIDT & HIS MUSICAL KNIGHTS. [video] Available at: https://www.youtube.com/watch?v=YzElCSJycoE [Accessed 24 Aug. 2017]. Kelley, C. and Sanders, G. (1978). Betty Harris - I'm A Little Tea Pot. [video] Available at: https://www.youtube.com/watch?v=OAC5q5XxiUA [Accessed 24 Aug. 2017]. Kelman Music Corporation (1939). 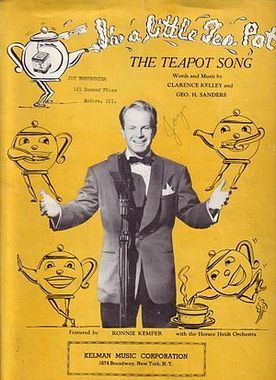 The Teapot Song sheet music cover. [image] Available at: http://4.bp.blogspot.com/_r-iMNjiCcq0/SlvisI5GOKI/AAAAAAAAEgo/YnLMwii9B-w/s1600-h/teapot+song.jpg [Accessed 24 Aug. 2017]. Sanders, R. (1972). Reflections on a Teapot, the Personal History of a Time. 1st ed. New York: Harper & Row.